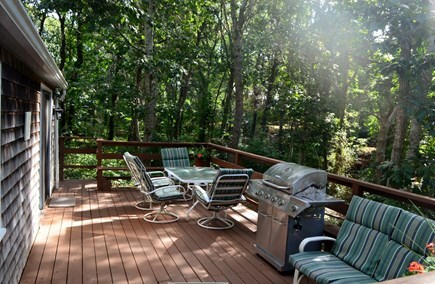 Large back deck for reading, relaxing, grilling or bird watching. Relaxing beach within a short walk! 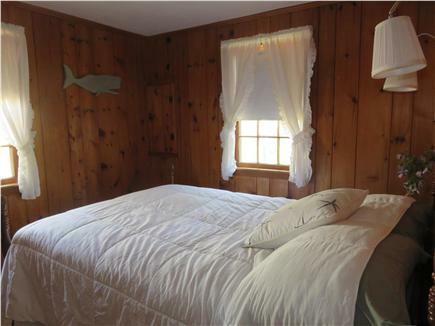 This lovely cottage is located on a quaint, tree-lined country lane, walking distance to Nantucket Sound beaches in a quiet neighborhood ideal for long strolls. Gather on the large deck for grilling, entertaining, or simply relaxing with a book while listening to birds. 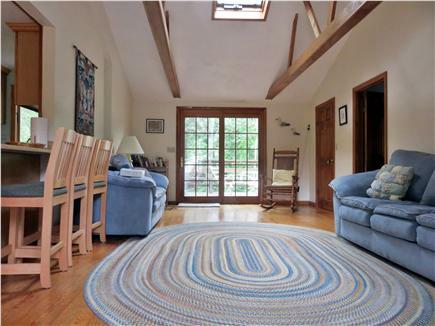 The superb location gives you easy access to Cape Cod's best restaurants and shopping, a major bike trail (located a few streets away), and is walking distance to: Pleasant Street Beach (1/3 mile), Forrest St. Beach (1/2 mile) and Red River Beach (1 mile). With the tree lined yard you have great privacy - peace and quiet when you want it, yet close to activities. 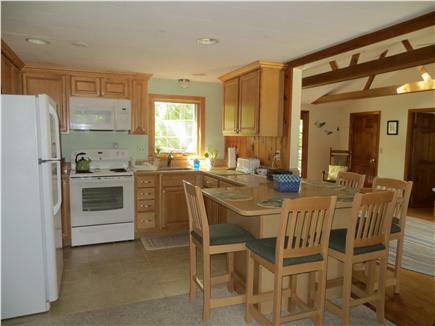 This one story ranch style home includes a large great room with cathedral ceiling, a den, 3 bedrooms, kitchen/dining area, bathroom, and a washer and dryer in the cellar. Perfect for a family! 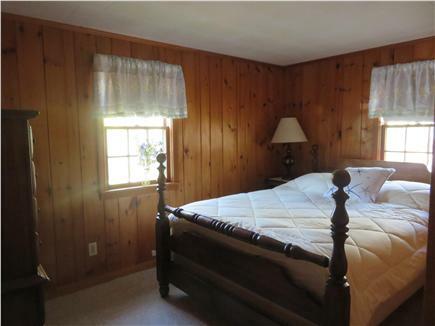 It has an over-sized deck accessed by french doors, and an additional outside shower. 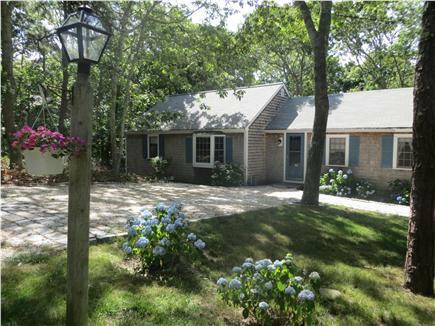 Driveway is white seashells bordered by cobblestones and will accommodate up to four cars. Additional availability info: Smoking is permitted ONLY on the deck or outside. This is a Saturday to Saturday vacation rental. Additional pricing info: There will be an additional cleaning fee of $200.00.Discount given for multiple week rentals. State and local taxes of 12.45% will apply. One story ranch style with one step into the home. We spent an August week at this lovely house. Despite other houses being nearby, the location is quiet and private. 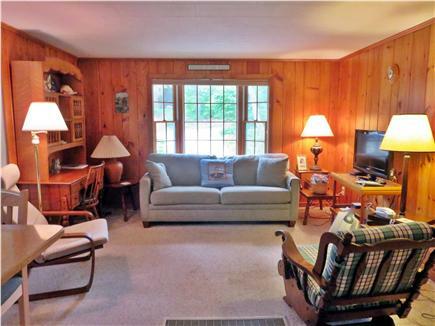 The house is comfortable in the way a vacation home should be: clean and casual. The house easily accommodates six or seven people. 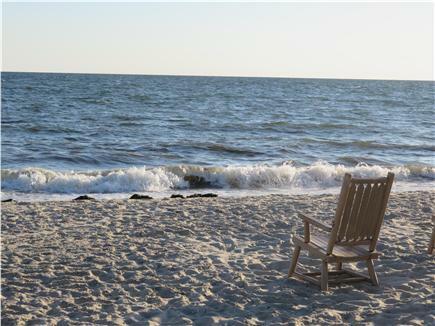 We particularly enjoyed the large deck with grill and comfortable furniture and the short walk to the beach. We are so glad that you enjoyed your stay at our cottage. Enjoy the rest of the summer and we hope to see you back next year. 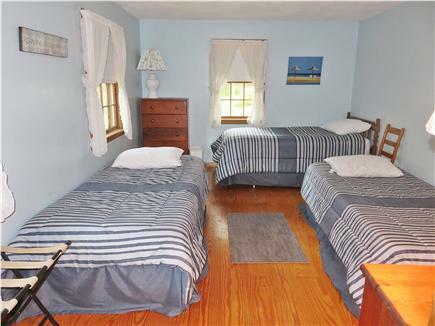 We have rented on the Cape for 3 years with the same budget and this by far was our favorite. The space is excellent for family and friends with plenty of places to sit if it's sunny or rainy. The bike trail to Chatham is easy to get to without riding on busy roads. Of course it is a short walk to the Sound. 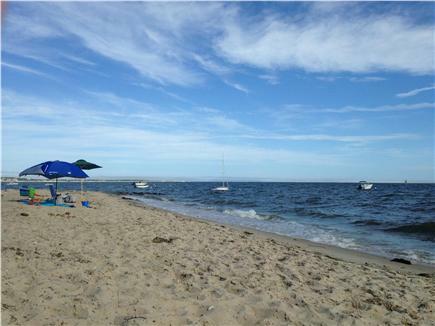 We prefer swimming at Nauset and it is an easy 20 + minute drive. Thank you, Sara. We are so glad you and your family had a good time at our cottage. Enjoy the rest of the summer and we hope to see you return next year.